Not long after Abraham called to say that Sara was ill, and had been obliged to leave the cabin where she had been stopping, and he had made her a shelter under a bank, in the bog, by the strand. She was no longer able to walk about, and daily Abraham brought a little saucepan, suspended by a cord for a handle, to get the broth, which Mrs. S. provided for his beloved Sara. He said he "had made her as comfortable as his owld hands could, but the breath would soon be cowld in her, for she could scarcely lift the hand to raise the broth to the lip." This bed was made in the bog, within a few yards of the sea, but sheltered from its spray by a bank, under which a narrow place had been dug by Abraham, which partly covered Sara. Heath was put down for her bed, and pieces of turf for her pillow; a wall of turf a few inches high extended round, making the shape of a bed, against the side of which was a fire of turf, made to warm the broth; and this was Abraham and Sara's house. Abraham's part was wholly unsheltered. For days she was nursed in the most careful manner; her cloak was wrapped snugly about her; the heath under her was smoothed, and her broth carried by Abraham; and he even washed her garments in the sea, "for Sara," he said, "loves to be clean." In spite of all his care the life of Sara was fast ebbing; and Mary A., who had seen before the bed where she lay, called one evening and found her much altered. She raised her up, gave her a little milk, which she could scarcely swallow. "I am departing," she whispered, "and will ye give my blessin' to the mistress?" She had come into the parish, she said, to die, because "she knew the mistress would put a coffin on her owld body." While Mary was here, Abraham hastened to Mrs. S. to procure some necessaries for the night; then returning, he sat by the side of Sara till she died. He was sitting alone, by her lifeless body, when Mary returned in the morning. The mistress was soon there. She had ordered a coffin, and brought a sheet to wrap around her body, and a handkerchief to put about her head. Mary washed and combed her, and found in her pocket a piece of white soap, carefully wrapped in a linen rag, and a clean comb, which were all that appertained to Sara of this world's wealth, except the miserable garments she had upon her. When the body was shrouded, it was placed in her coffin of white boards; a boatman and Mary lifted her into a boat; Abraham and the mistress seated themselves in it, and were rowed to land, and put the remains of Sara in an out-house belonging to Mr. Savage, for the night, and a comfortable place was provided for Abraham to lie down. Early in the morning Abraham was found sitting on the cart, which bore Sara from the boat, with his gray head leaning against the locked door, weeping. He had waited till all was still, and then crept to the spot which inclosed the remains of her he loved, to weep alone, in the stillness of night. Not one that saw him but wept too. This simple-hearted man, like the patriarch whose name he bore, was a stranger and sojourner, like him he had come to mourn for Sara, and he had come too to ask a burial-place for his dead, though he could not, like him, offer a sum of money; he could not take his choice in the sepulchres; no field of Ephron, nor the trees within were made sure to him, but in a lone bog, where those who had died by famine and pestilence were buried, like dogs, unshrouded and uncoffined, he was grateful to find a place to bury his "dead out of his sight." The corpse was borne away by a few boatmen across the channel; and Sara was conveyed to her long home. I saw Abraham early in December, 1847, and the bed which he made for Sara, on that bleak sea-shore. The turf wall was still unbroken; the smoke, where the fire had been made, had left its blackness; and a piece of turf, partly consumed, was lying by this hearth; the heath-bed had not been stirred, and I begged Mrs. S. to keep it from the inroad of cattle. 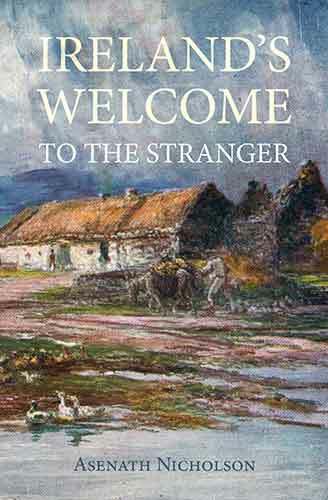 A wall of stone should be built around that dwelling, and the traveler pointed to it, as a relic of the greatest interest.—A relic of Ireland's woes! It is said that Sara, in her father's house, was "fair to look upon," and enjoyed in plenty the good things of this life; and, says Mrs. S., "when first I saw her the sun was shining in full strength upon her marble face; and so swollen its wrinkles were smoothed; her countenance was mild, her manner modest and pleasing, and she was an object of much admiration. She lay in that lowly bed in storm and sunshine, by night and by day, till the "good God," as she expressed it, "should plaise to take her away:" yet lowly as was her couch, lonely as was her wake, unostentatious as was her burial, few, in her condition, were honored with so good a one. In the same vicinity was the bed of a little orphan girl, who had crept into a hole in the bank, and died one night, with no one to spread her heath-bed, or to close her eyes, or wash and fit her for the grave. She died unheeded, the dogs lacerated the body, gnawed the bones, and strewed them about the bog.